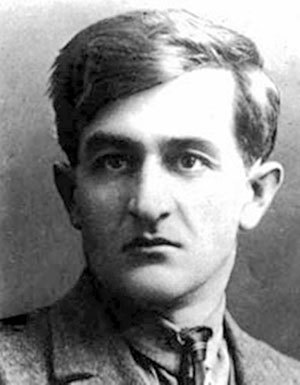 Axel Bakunts was the most important prose writer in the first generation of Soviet Armenian literature. As many other intellectuals, he would also become a victim of totalitarianism. Ba kunts was born Alexander Tevosian on June 13, 1899, in Goris (Zangezur), in a family with eleven children. As he wrote in his autobiography, “my parents had had land and wealth, but I did not see either that land or that wealth. I recall horrendous poverty and a house filled with children. . .” He studied in the parish school from 1905-1910 and then he was admitted in the Kevorkian Seminary of Etchmiadzin, where he studied until 1915. After his short story, “The Fool Man,” published in the children’s monthly Aghbiur in 1911, a satirical piece appeared in July 1915 in the newspaper Paylak under a pseudonym, that cost him a stint in prison, as it was a criticism of the mayor of Goris and the provincial administration. The Seminary was closed in the school year 1915-1916 due to the flow of refugees from the genocide, and after 34 days, the future writer was freed from prison and invited to teach at the village school of Lor, in Zangezur. By then, Alexander had been replaced by Axel, as his friends called him after the name of the character he played in a comedy, “The Newly Married,” by Norwegian writer and Nobel laureate Bjørnstjerne Bjørnson. He would later adopt the family name Bakunts as his pseudonym. He graduated in 1917 from the Seminary, and in the fall he became a soldier in the battlefronts of Erzerum and Kars, until his participation in the crucial battle of Sardarabad in late May 1918. He worked in Yerevan as a proofreader and reporter in 1918-1919, and in 1919-1920 he studied at the Polytechnic Institute of Tiflis and taught at the high school of an orphanage. After three years of studies at the Agricultural Institute of Kharkov (Ukraine), in 1923 he returned to Armenia, where he worked as an agronomist. In the same year, the authorities organized the so-called “liquidation” of the Armenian Revolutionary Federation in a conference of party members, and 24-year-old Bakunts chaired the conference. He worked in Goris from 1924-1926 as head of the land section of the executive provincial committee, and moved in 1926 to Yerevan, where he was deputy head in the Land Commission of the republican government until 1931. After a short stint at the Nor Ughi journal, he dedicated himself to literary activities until 1936. Bakunts started a serious literary career in 1924, and his short stories soon established his reputation as a gifted writer, which was strengthened by his first collection, Mtnadzor (The Dark Valley), published in 1927. Together with Yeghishe Charents, Gurgen Mahari, and other first-rate writers, he was also involved in the literary movements of the time, and fought for the development of Armenian literature in years when the Soviet regime had not yet established its iron fist over culture. Besides several collections of short stories (The White Horse, The Walnut Trees of Brotherhood, etcetera), he published the satirical novel Hovnatan March and also wrote three novels that were lost. He also wrote the screenplays for the films Zangezur and The Son of the Sun. As Charents wrote in a poem dedicated to his friend Bakunts, “Sadness flows in your Dark Valley / And longing of childhood in the familiar valley, / But work to ensure that in that dark valley / Your bright road will not be lost forever.” There was an insidious campaign against both writers, as well as their friends, especially by fellow writers who tried to follow faithfully the directives of the Communist party. Political accusations started to pile up and Bakunts, together with other names, was victim of a round up on August 9, 1936. He was charged with “anti-revolutionary, anti-Soviet and chauvinist activities.” He was tortured for eleven months in jail. All his attempts at defending himself were useless, and his letters remained unanswered. As many others who were subjected to the terror installed by Stalin in 1936-1938, he was finally given a 25-minute trial and summarily condemned to the firing squad. He was shot on July 18, 1937. His name disappeared from public recognition until the death of Stalin in 1953. He was later rehabilitated and Bakunts became a classic of Armenian literature in the twentieth century. In 1957 his childhood house became a house-museum.